Fermentation is an ancient practice used by many civilizations, dating as far back as 6,000 B.C. Many cultures experimented with fermentation to make their food last longer– the Koreans with kimchi, the Chinese with stinky tofu, the Greeks with yogurt, etc. Fermented foods are aged over time with mechanisms that allow good bacteria to fester and break down the molecular structure of the food. Fermented foods can sound unappetizing. You might even cringe at the thought of putting something half-decomposed into your mouth. Fermented foods are actually highly nutritious and packed with vitamins and enzymes not found in “normal” foods. Your body needs the vitamins and enzymes found in fermented foods. Fermented foods are prepared through a natural process called lacto-fermentation. The good bacteria present in this process is called lactobacillus. Lactobacillus converts starches and sugars into lactic acid, which provides a natural preservative for the food. This process also preserves the nutrients, vitamins, enzymes, and probiotics found in the food. Fermented foods also aid with overall digestion in the stomach. There is a food epidemic due to the lack of good bacteria and enzymes in foods. In a society where fast and microwavable food proliferate, we lost the essence of wholesome nutritious meals. Foods found in commercial markets are over-processed and pasteurized. Milk is stripped of its live and raw cultures through pasteurization. Certain yogurts do not have beneficial probiotics. Pickles and sauerkraut are doused in vinegar for preservation instead of being made with the natural lacto-fermentation process. Heat and radiation kills any enzymes present in food. When you eat microwaved or over-cooked food, you may satiate your hunger; but you empty your food of the essential nutrients you need. Don’t be fooled by your full stomach. If you eat only processed food, you deprive yourself of the key enzymes needed to break down your food. Without these enzymes, your body cannot absorb the necessary nutrients you need. Fermented foods are rich in enzymes and probiotics. The body needs these friendly bacteria and little enzymes to survive. The right balance of good and bad bacteria in your gut boosts your immunity and contributes to improved health. Read more about how a healthy digestive system improves overall health here. Which fermented foods should I incorporate in my diet? Granted, some of you may not enjoy the taste of fermented foods. It takes a while for your taste buds to get accustomed to; but once they are, you might enjoy them. Beverages like kefir (fermented milk) or kombucha (fermented tea) are one way to ease into the world of fermented food. If you are adventurous, you can also give kimchi a try. Kimchi is an ancient staple in the Korean community made of fermented Napa cabbage and other spices–and it’s quite tasty. Pickles, olives, and sauerkraut are also good options. Not just any pickle, olive, or sauerkraut will do. Make sure that they have gone through the natural fermentation process; that’s the only way you will get the beneficial bacteria and enzymes that you need. You will most likely find these at a local health food store or farmer’s market. They need to be refrigerated and not sit on a shelf. If eating fermented foods is not your thing, try supplements that contain fermented extracts. Fermented Japanese mushroom can be found in a supplement called Active Hexose Correlated Compound (AHCC). Fermented wheat germ extract (FWGE) is another potent and effective way to improve your digestive system health and boost your immune system. Incorporate fermented foods or supplements into your regular diet to provide great benefits to your health. Over time, your body will notice the difference: higher energy levels, better moods, increased immunity against sickness, and even weight loss. Eventually, your taste buds might start to like it! Not only will your mouth thank you, but your gut and entire body will thank you as well. 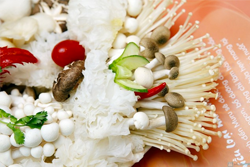 “Health benefits of Fermented Foods.” Wellness Mama. Web. 18 May 2015. “Lacto-Fermentation as a Method of Food Preservation.” Cultures of Health. Web. 18 May 2015. Gremont, Lindsey. “What are Fermented Foods?” Homemade Mommy. Web. 18 May 2015.